Situated on the bank of River Rangeet is the hot spring 'Phur Tsa Chu', half an hour drive from Legship and one hour drive from Jorethang. Pilgrims from all walks of life come to dip in this hot spring during the month of January to March. TheÂ Buddha Park of Ravangla, also known asÂ TathagataÂ Tsal, is situated nearÂ RabongÂ (Ravangla) inÂ South Sikkim district,Â Sikkim,Â India. It was constructed between 2006 and 2013 and features a 130-foot high statue of theÂ BuddhaÂ as its centerpiece. The site was chosen within the larger religious complex of the RabongÂ GompaÂ (Monastery), itself a centuries-old place of pilgrimage. Also nearby isÂ Ralang Monastery, a key monastery inÂ Tibetan Buddhism. Located between Namchi town and Samdruptse, this popular garden has many attractive plants, flowers and species of trees. A number of waiting sheds, view points and water bodies along its footpaths have been provided. A neat and clean cafeteria serves the tourists and visitors well. Samdruptse, which translates as "The wish fulfilling hill" in local Bhutia language, lies close to Namchi in the South Sikkim region. It is at about 75 km from Gangtok. Gazing upon the town and across the hills, on Samdruptse hill, stand a giant statue of Guru Padmasambhava, also known as Guru Rinpoche - the patron saint of Sikkim who is believed to have blessed the land of Sikkim. The statue is about 135 feet tall and covered in shimmering gold, sparkles in the sun and is the tallest figurine of his in the world. The foundation stone for the statue was laid by His Holiness the 14th Dalai Lama in the year 1997 and construction of the statue was completed in about three years of time. 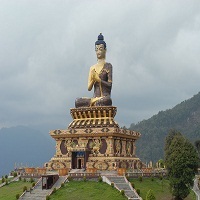 The views are spectacular across and the statue can be seen from across many places in Sikkim and Darjeeling. 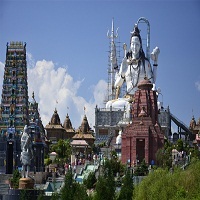 This Pilgrim Centre has a most important temple of 108 feet height on which is established the 87 feet high statue of Lord Shiva. Apart from this there are also replicas of the twelve Jyotirlingas, to offer one platform to worship for the devotees of Lord Shiva. A statue of 16Â½ feet height of Lord Kirateshwar is also installed in this place. As per the Hindu belief in order to attain Moksha, one has to perform pilgrimage to all the existing four Dhams, hence, replicas of these four Dhams, namely Badrinath, Jaganath and Dwarka dedicated to Lord Vishnu and Rameshwar, dedicated to Lord Shiva is also been built in the same premises. The pilgrim centre is constructed in an area of 28.958 Hactare of land on top of the Solophok Hill just 5 kilometers from Namchi town.